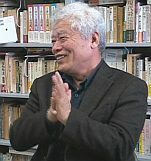 Professor Tsubouchi Nenten is an acclaimed gendai haijin and innovator, notable for his unique creative vision. He currently teaches at Bukkyo University, Kyoto. Haigô & Persona — Historically, haiku poets have used Haigô, “pen-names” to create multiple personae, each an autonomous creative creative entity; this psychological process is both a central aspect of Nenten's compositional approach and is an integral part of the haiku tradition. Masaoka Shiki is also discussed in this regard. The second part of the video focuses on Shiki's sense of language play as a core concept of his shasei (“sketch of life”) approach to haiku. Nenten suggests that the shasei was never meant to be seen as a poetics of profundity: his main disciples and later poets having distorted Shiki's main intention, with the result that the low contemporary critical valuation of Shiki's thought represents a misunderstanding. Nenten thus sheds new light on the significance of Shiki's creativity.